This second week of the semester is going better than the first. Sure, I hid in the kitchen yesterday afternoon and ate cookie dough out of the bowl while the kids watched an episode of VeggieTales. But I haven't cried so far this week. Not even when my minivan died momentarily at an intersection and people honked at me. Always helpful to be honked at. That makes me remain level-headed and also magically makes my car start up again. The dog ate Bubby's favorite movie while he was at preschool. When he came home and I told him, he cried and kept saying, "What a sad, sad day. I'm so sad. What a sad, sad day." Scout came over to comfort him with a lick and a sniff which only made him yell at her to go away and repeat, "What a sad, sad day." It was equally heartbreaking and hilarious. Bugaboo has had a lot of good moments lately to counteract the moments where he just screams, (like today at naptime and bedtime). He is obsessed with the Pete the Cat books. He flips through them and "reads" them. I think it is because of the Groovy Button book that he has been fixated on belly buttons today, which he calls, "Button-Button!!" He says it with a lot of enthusiasm, and then says, "Oh, fun-ny." His intonation for "funny" is just like my friend, Christy, from high school, and I think of her every time he says it. He also likes the word, "groovy," now. I signed up for a 5K - The Glow Run - which I am hoping is low-key for my first 5K since I still stink at running. I don't get to the gym as often as I need to. I have days on the treadmill when I want to cry. But I can't because people would stare and my inner-Jillian/Tom Hanks combo is screaming, "There's no crying in baseball!" So some days I don't push myself, and I end up walking more than I should. Yesterday I did push myself, and it felt horribly great. Today I cursed myself for even signing up for a run - me the girl who never got an A in P.E. Learning to run is teaching me much more about myself than it is teaching me to run. I am not sure how I feel about that. One final bit of news - tomorrow I go in for a combined IFSP (think IEP) and transition meeting for Bugaboo. In December he ages out of First Steps, so we have to begin the process now of seeing what services he will qualify for in our school district's early childhood special education program. I have a lot of thoughts I am processing about this as well. Dinner all by myself on Thursday night. Glorious. My four-year old insisting that the dress I was wearing were jammies. My two-year old saying, "Hold you." and "Hug you." when he wanted to be held/hugged. 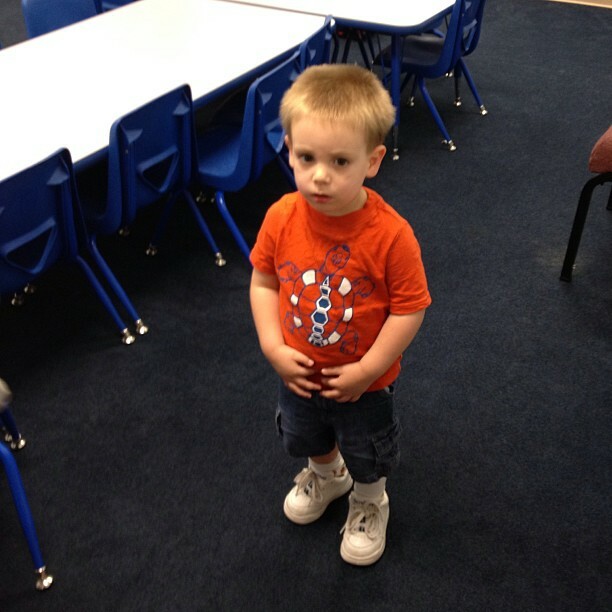 Bugaboo starting Awana - he gets to be in a class with his peers instead of staying in the nursery. 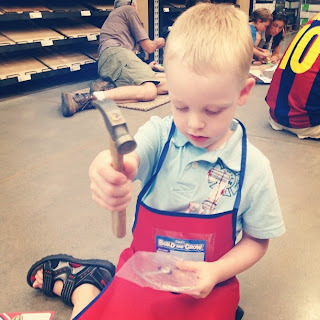 Bubby and I hit up Lowes for the first time for their free workshop. We built a very sad looking airplane, but we had a good time. Ann Voskamp's words of wisdom, "There are weeds and disappointments and seeming failures. There are days that tear out still-beating chunks of your bare heart, whole seasons that feel like every breath is through burning smoke. There is always hope. The real essence of the universe is endless grace – which is the theological term for surprises." Never a dull moment around here. How is your new place? Let's do coffee again in September! Thanks for praying. It went well. I'll update about that at some point. I am regretting signing up for a race. I am not ready. I tried to get The Hubs to say he'd run it for me. His response, "I already know I can run a 5K." Apparently that was supposed to motivate me more. ha. I'm doing the glow run too! But, here in Maryland, of course. You go, girl! Hope Bugaboo's meeting goes well. So great that he's picking up speech. Graham says 'hold you' when he wants to be held, too. It's cute! The little phrases that they swtich around are so fun. Any advice for running a race? I'm newer than a newbie. Not really...I've only run a few races. When the race first starts, there's so much adrenaline and I always run too fast and then feel like I'm gonna die for about 3 minutes and THEN i remember to pace myself.